Guo, H., Lorenzi, P. L. and Ding, Z. (2015). Nanofluidic Proteomic Immunoassay. Bio-protocol 5(14): e1537. DOI: 10.21769/BioProtoc.1537. Nanofluidic proteomic immunoassay (NIA), consisting of isoelectric focusing followed by sensitive chemiluminescence detection, has the potential to quantitatively characterize protein post-translational modifications that cause shifts in isoelectric point (pI). This protocol details the NIA analysis of protein phosphorylation using AKT as an example. This protocol can be used for two platforms, NanoPro 1000 and Peggy Sue, from ProteinSimple Company. NanoPro 1000 separates proteins based on charge. Peggy Sue separates proteins based on either charge or size. The platforms can analyze up to 96 samples at a time with lysates from as few as 25 cells per assay. Detailed information of the platforms is available on ProteinSimple’s website (http://www.proteinsimple.com). Culture cells (such as HeLa or HCT116 cells) in DMEM or McCoy’s 5A medium supplemented with 10% FBS to 80-90% confluence in 10 cm plates. Treat cells as required. Gently wash cells in plates with 10 ml ice-cold PBS. Aspirate PBS thoroughly. Add 400 μl ice-cold RIPA or Bicine/CHAPS lysis buffer supplemented with both aqueous and DMSO protease/phosphatase inhibitor mix to each 10 cm plate on ice. Gently swirl plates to ensure good coverage and incubate for 10 min on ice. Scrape cells thoroughly. Pipet up and down to mix. Transfer buffer and cells to a 1.5 ml microfuge tube and incubate for additional 20 min on ice. Vortex the tube briefly every 5 min. Clarify by centrifugation (14,000 x g, 10 min) at 4 °C. Transfer supernatant to a fresh microfuge tube. Immediately aliquot supernatant (10-30 μl per aliquot) on ice and store at -80 °C. Measure protein concentrations using the BCA protein assay kit. In a microfuge tube, combine 110 µl premix G2 pH5-6, 110 µl premix G2 Servalyte pH5-8, 3.95 µl ladder 3, 1 µl Standard 5.5, and 4.5 µl DMSO protease/phosphatase inhibitor. Vortex for at least 15 sec to mix thoroughly. Aliquot 19 µl of the mix to each of 12 microfuge tubes. Dilute 5 μg of high concentration lysate with sample diluent or Bicine/CHAPS buffer to a final volume of 6 µl. Add the 6 µl of diluted lysate into one of the 12 tubes with 19 µl of the mix. The final protein concentration in capillary is 0.2 µg/µl. Add 10 µl of lysate mix into wells in row A (see Table 2). Prepare primary antibodies at 1:50 dilution with antibody diluent (from the secondary antibody detection kit) in microfuge tubes. Add 10-20 μl of diluted primary antibodies into appropriate wells of 384-well assay plate (see Table 2). Prepare secondary antibodies at 1:100 dilution with antibody diluent in microfuge tubes. Add 10-20 μl of diluted secondary antibodies into appropriate wells of 384-well assay plate (see Table 2). Prepare SA-HRP at 1:100 dilution with antibody diluent. Add 10-20 μl of diluted SA-HRP into appropriate wells of 384-well assay plate (see Table 2). Combine 120 µl XDR peroxide and 120 µl luminol, mix well, and then add 10-20 μl of the mix into appropriate wells of the assay plate (see Table 2). Centrifuge the assay plate at 2,500 x g for 5 min to spin down the liquid and eliminate bubbles. Protect the plate from light before loading into the equipment. While the plate is spinning, create the assay file in Compass software. Set up as below for AKT assay. Table 2. An example of an assay layout. Assays are set up in 384-well plates. Table 2 was an example of an assay layout for 12 samples and 6 antibodies. Lysates were added into wells in row A from A1 to A12, respectively. Diluted primary antibodies were added into wells in row B (B1 to B12) to row G. Diluted secondary antibodies were added in row H (H1 to H12). Streptavidin-HRP was added into row I (I1 to I12). To avoid possible contamination between streptavidin-HRP and detection reagents in the plate, Lumino/Peroxide XDR was added into row A (A13 to A24) away from streptavidin-HRP. Empty waste bottle and fill wash bottle with fresh ultrapure water. Fill the wash buffer, Anolyte and Catholyte cups. Put capillary box in the primary capillary box position. Click the “RUN” button to start the assay. Data analysis is performed with the Compass software provided by ProteinSimple. In Image Analysis Settings, view data for different exposures in the Analysis screen. Choose the best exposure time according to the intensity of the signals. In Peak Fit Analysis Setting, set up Range (for AKT): minimum: 4.5, Maximum: 7.0. In Standard Analysis Settings, choose Std. Ladder 3 (premix pI 5-8) and add Standard 5.5 to the pI column and enter 500 in the Position column of the Fluorescent Peaks table. Select 4.9 and 7.0 for capillary registration by clicking the checkbox in the Registration column. 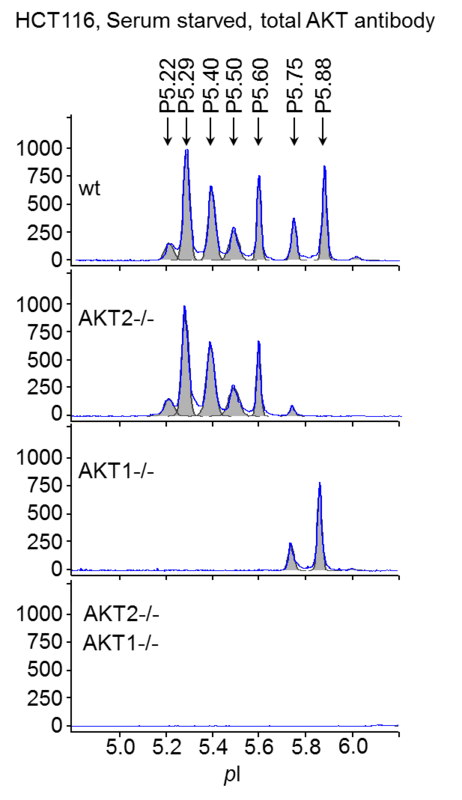 Multiple peaks of AKT were detected by NIA using total AKT antibody representing both AKT1 and AKT2 isoforms as well as differences in post-translational modification (PTM) of each molecule (Fig. 1). No AKT3 is expressed in HCT116 cells. Figure 1. AKT isoforms characterized by NIA. Wt, AKT2-/-, AKT1-/-, and AKT1, 2 double knockout HCT116 cells were serum-starved overnight and lysed in NIA RIPA buffer. Samples were analyzed with anti-total AKT antibody. pI is shown on x axis and chemiluminescence on y axis. Keep samples on ice all the time. Always use protease and phosphatase inhibitors to preserve phosphorylation signals. Try to maintain low sample ionic strength to avoid shifts during IEF separation. The final total salt concentration should not exceed 50 mM in the capillary. Bicine/CHAPS or RIPA lysis buffers from ProteinSimple are recommended. It is imperative to obtain a high protein concentration if cells are harvested in RIPA buffer. Capillaries are light and humidity sensitive. Protect capillaries in opened packs from light and humidity. The work was supported by National Institutes of Health (NIH) grant 5R21CA126700 and a grant from the University of Texas MD Anderson Cancer Center Kidney Cancer Multidisciplinary Research Program to ZD. The protocol was adapted from our published paper in Oncogene (Guo et al., 2014) with modifications. Guo, H., Gao, M., Lu, Y., Liang, J., Lorenzi, P. L., Bai, S., Hawke, D. H., Li, J., Dogruluk, T., Scott, K. L., Jonasch, E., Mills, G. B. and Ding, Z. (2014). Coordinate phosphorylation of multiple residues on single AKT1 and AKT2 molecules. Oncogene 33(26): 3463-3472. How to cite: Guo, H., Lorenzi, P. L. and Ding, Z. (2015). Nanofluidic Proteomic Immunoassay. 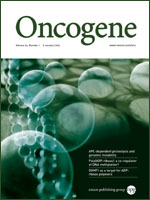 Bio-protocol 5(14): e1537. DOI: 10.21769/BioProtoc.1537.